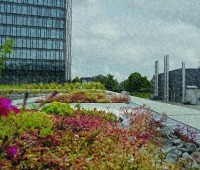 We provide the most versatile and flexible green roof systems on the market. Our unique, compact and layered design creates a clear separation between protection, drainage and growing functions. 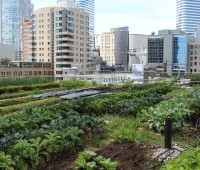 Uninterrupted drainage layers and engineered growing medium are the success to our green roof systems. ZinCo’s light weight green roofs are assembled on site, layer by layer, and designed to accommodate the specific roof it’s intending to cover. The growing medium is applied as a single layer to cover the entire area — mimicking a more natural growing environment, and resulting in healthier plants. All our systems are also engineered to exceed storm water management, wind uplift and fire codes in Canada, and we are working with the NRC to develop new wind uplift standards. 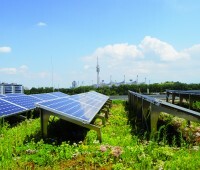 All systems are designed, manufactured, shipped and assembled with a greener world in mind. Assemblies are built with no vertical dividers, lowering plastic content, and reducing costs. 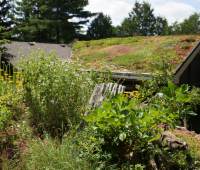 Our roofs use the most durable recycled or plant-based plastics, and are 100% recyclable. 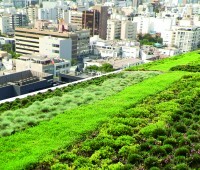 Extensive green roofs are the perfect starting point for existing buildings or new builds looking to get green. ZinCo offers two different versatile systems.